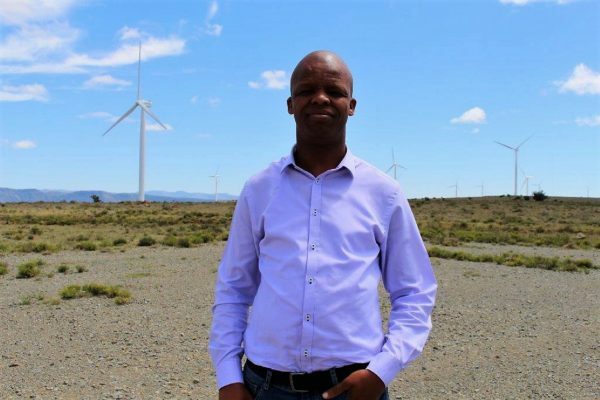 Local Cookhouse resident Lifa Baskiti, has taken on the key role of Community Operations Officer (COO), for Cookhouse Wind Farm. The primary role of the COO is to form a bridge between the wind farm and the surrounding beneficiary communities of Cookhouse, Bedford, Adelaide and Somerset East. “I’d like to imagine that it’s my job to tap into the mood of the community and close any existing communication gaps, which is why it makes sense for the wind farm to have chosen a COO that not only understands the dynamics of the community but relates to the hearts and minds of people within it,” explained Lifa Baskiti. Born and raised in Cookhouse, Lifa comes from a family with a long history from within the community. He believes that Ubuntu is alive and well within the community and is pleased that his job will enable him to help impact the community in an effective and efficient way. Having previously worked in the government sector, where the pace is far slower due to the hierarchy, now as the COO of the wind farm, where the structures are simpler and the resources are readily available, Lifa is able to witness the impact of his work in a shorter period. Commenting on the impact and importance of Cookhouse Wind Farm’s Socio-Economic Development, he says, “Both education and primary health care are critical elements in the development of our local communities. But if I had to choose, I’d say that primary health care has an immediate impact, especially the work that we do within the farming communities. However, whilst education may take longer to bring about change, it will have a lasting impact on generations to come”.